This is an intense strategy board game in a steampunk world of corrupt capitalist gremlins who compete for money, political power and prestige. Save and invest, steal and extort, arrest and get arrested – in single-player and multiplayer, with ranks and ladders, team mode and spectator mode. Featuring seasonal content updates, regular tournaments, item drops, full support of Steam Community Market – and more!HOW DO YOU PLAY THIS GAME? Gremlins, Inc. is designed for up to 6 players, in multiplayer or in single-player mode (with AI bots). Each player has 6 cards on their hand (replenished from the same deck) and uses them either to move around the playing field or to perform different game actions. There is a lot of interaction with other players, and duels are significantly different from 3-player or 4-player games. You can play until a certain score limit, or until agreed number of rounds, or for time limit. The game offers both custom and ranked sessions (with matchmaking by rating).CAN YOU PLAY IN TEAMS OR JUST WATCH? Yes, you can! In addition to custom sessions (where you define the parameters of the session and may optionally set filters for those who can join you) and password-protected private sessions (so that you and your friends can play undisturbed), the game offers team mode (2x2, 3x3, or 2x2x2) with teams of human players and/or AI bots. Gremlins, Inc. also supports a built-in spectator mode, which allows you to watch sessions of other players right from inside of the game, sharing your emotions with players and other spectators through messages and emoticons.CAN YOU PLAY THIS GAME OFFLINE? Certainly! 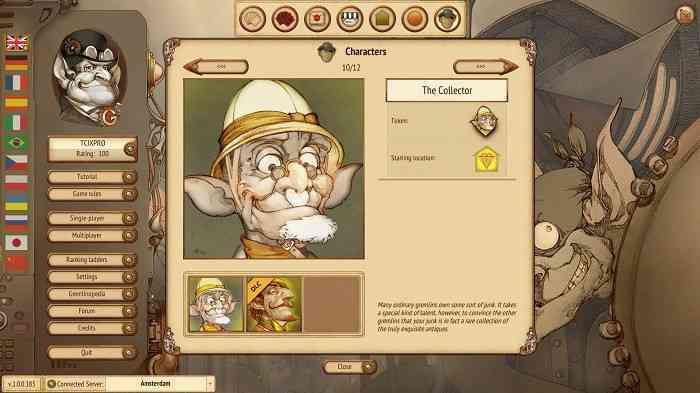 When you buy this game, you get 2 products in your Steam Library: Gremlins, Inc. – the edition that is playable online in single-player and multiplayer modes, with full support of item drops and Steam Workshop; and Gremlins vs Automatons – the edition that is playable offline in single-player mode, without any connection to our server whatsoever.HOW LONG DOES IT TAKE TO PLAY ONE SESSION? The game offers different session settings to make them fit your available time, and single-player mode offers automatic SAVE / LOAD function at every turn so that you can take a break whenever you want (while multiplayer mode offers re-connect functionality as long as the session is still in progress). A quick duel for 20 score points with a fast timer can finish in under 20 minutes, while a 4-player session for 60 rounds can last for 2 hours or more.SHORT-TERM AND LONG-TERM STRATEGIES? There are different types of cards in the game (permanent, regular, secret and criminal) and as each card can be used either to move or for action, you will develop both short-term and long-term strategies for making the most out of where you are, and what you currently have in your hand. Normally, you spend half of your game time accumulating resources and building the foundation for the end-game, and the other half trying to control the progress of your opponents (stealing, arresting, initiating player conflicts, and so on). The more you play, the more new strategies you will discover – especially when combining the effects of several cards played in a combination. This is an intense strategy game: make decisions at every round! Plan your moves, then adjust to the actions of the other players and new cards drawn. The design of the playing field and the multiple layers of optional features (that you can turn on or off, as you wish) allow for a variety of strategies. The more you play, the more roads to victory you discover, using a combination of features based on the particular setup of the session. The game offers a diverse resource system that allows for many comeback chances even after you're robbed or arrested (or both). With score, money, votes, malice, income and bribes, the tension often remains until the very last round. The multilayer mode of the game features a system of ratings, ladders and ranked sessions: compete in a specific league, and take part in the regularly organised tournaments with over 1,000 participants. A system of anonymous masks allows everyone to compete on equal terms in a ranked session. Additionally, the game offers over 10 single-player challenges plus the option to create custom single-player sessions with different settings and a different mix of AI bots. Finally, there's the team mode where victory is determined not only by strategic skill, but also by communication and coordination of each team, which is an entirely different layer of game mechanics. 179 cards in the main deck (143 of them – unique): permanent, regular, secret and criminal, each with a hand-drawn steampunk illustration; with each Season update, we keep adding several new cards to the deck. 38 events in the Misfortune deck: these are the special events triggered at certain moments in the game, and may affect the current standing of all players to a significant degree, especially when used on a specific opponent. 6 special Chaos Cards: this is an optional set of cards available to every player in the game; turn them on or off to change the dynamics of the session. 12 sets of Character Abilities: another optional feature that brings to the game special game mechanics unique to each character type; playing with these makes different competing strategies even more pronounced. 11 original locations: the Office, the Plant, the Dump, the Marketplace, the Inferno, the Jail, the Casino, the Court, the Treasure, the Bank and the Astral Plane; and 7 original spot types: Risk, Gamble, Police, Income, Bribe, Misfortune and Tribune. Finally, the game took us three years to develop from concept to full release, and we're still committed to continue supporting the community through development of new content. 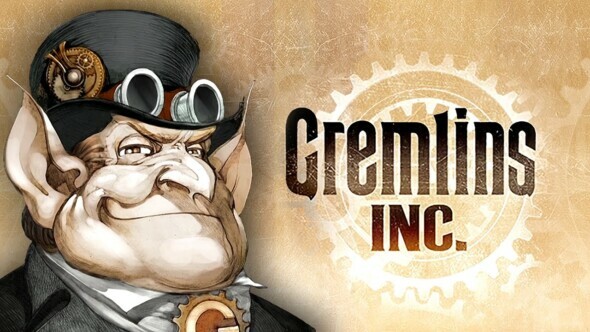 There are currently over 70,000 players of Gremlins, Inc. on Steam from all over the world, including USA, Russia, China, Japan, UK and France. Collectively, players launched over one million game sessions in the three months since its release. FINALLY, WHO ARE THE GREMLINS? You think that’s just a pocket watch in your hand, a watch that’s a bit late because you keep forgetting to wind it up? No, no and no – you couldn’t be further from the truth! What you carry around is a whole gremlin town packed into this tiny mechanism: a town with its own bank, its own casino… and even its own jail! Gremlins are the microscopic creatures that inhabit any mechanism that they can possibly infiltrate. If a watch or a telescope malfunctions, then it’s probably due to gremlins who took up a residence there. Gremlins, Inc. features in-game items and fully supports Steam Community Market. While playing the game, certain actions will trigger random chest drops with items of varying rarity: it could be a new emoticon, a new profile background, a new music track, or one of the dozens of other cosmetic items. These items are FREE, yours to use or trade on Steam Community Market. We, the developer, do not engage in the direct sales of any drop items; only players can trade them. The game also supports crafting: once you find a blueprint of a specific item, you can create as many such items as you wish, as long as you have the required number of charges (you get charges when you convert other in-game items that you do not want, or have multiple copies of). Finally, the game has its own Steam Item Store where we sell a very small number of unique items that influence the item meta-game (but they have no effect on the game mechanics). The game currently supports 2 separate servers: Amsterdam and Singapore. Players are able to check their ping value for each of these servers, and play on the server that is the most convenient. Each server has its own player ladder, statistics and player profiles. Most players choose Amsterdam, since ping to Amsterdam from anywhere in the world rarely exceeds 300. However, as we saw more and more players from the Asian region join the game, especially from China, we added the server in Singapore in order to be able to offer faster connection specifically to these players. We hope that this works well for every player, as good player experience is our top priority. We will continue to monitor the quality of our server/client connection in order to adapt the servers to the changing requirements and we thank you for your patience.